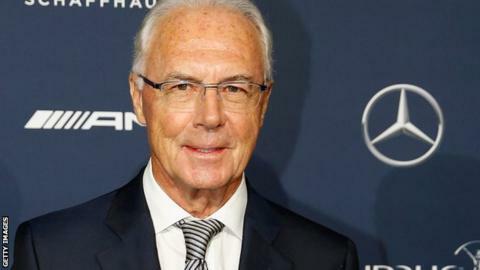 Germany's World Cup-winning captain and coach Franz Beckenbauer has been warned and fined by Fifa's ethics committee. Beckenbauer had been provisionally banned for "failing to co-operate" with Fifa's inquiry into the bidding processes for 2018 and 2022 World Cups, won by Russia and Qatar respectively. The 70-year-old was one of 22 men who voted to decide the tournament hosts. Fifa says he did not co-operate during an in-person interview and in response to written questions. Beckenbauer, who Fifa said subsequently demonstrated a willingness to co-operate, was fined 7,000 Swiss Francs (£4,900). Fifa did not look into matters relating to the awarding of the 2006 World Cup to Germany. Beckenbauer was head of the tournament's organising committee which, reports alleged, made a payment to Fifa in return for a financial grant. In October, he said he made a "mistake" in the bidding process but denied votes were bought. Der Spiegel magazine reported an alleged slush fund of 6.7m euros was used to buy votes for Germany - an allegation denied by the German Football Association (DFB). Beckenbauer captained West Germany to victory as hosts at the 1974 World Cup, and was coach when they next lifted the trophy in Italy 16 years later. He then managed Marseille and Bayern Munich, where he is now honorary president.